Once you have a camera in your hand, you tend to see things in a different angle. Though I hate to admit the cliche, I do try to imagine and see things in a rectangle frame. Previously, I would see things as just things! Trees as trees, lanes as lanes, nothing more and nothing less. 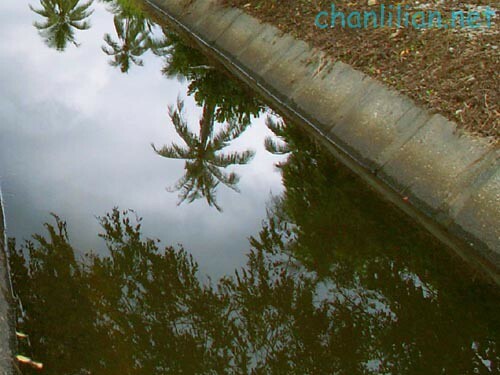 But when you know what you see can be transformed into another dimension on the camera, you tend to see lanes as beautiful lines, trees as silhouette, dirty drains as great reflective surfaces and etc. I would probably dismissed the above as a boring village with paddy fields. 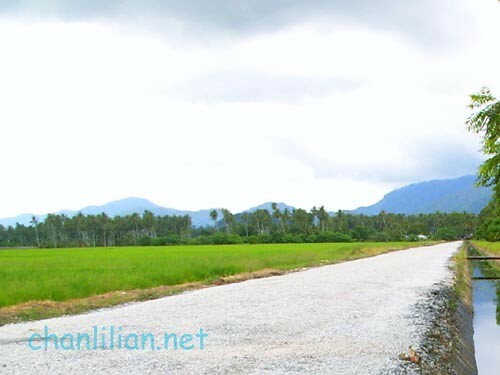 But with a camera, I see a really, ethnic, Malaysian scenery of green paddy fields, beautiful blue sky (but it was about to rain), small kampung (village), tall, swaying coconut trees and a dainty, white lane. Normally, my photos shown here are ‘as it is’ basis. I do not use any photo editor to touch them up except for an occassional brightness or contrast. However, this particular photo was ‘accidentally’ edited by Picasa (a freeware). I really do not remember touching up this photo but discovered it in my folder. I kinda like the green and blue combination. I must have accidentally put some filter over the photo or something. 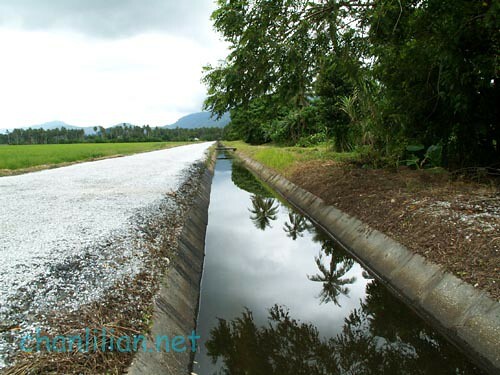 A black, murky water way which is to irrigate water to the paddy field. Long time ago, boys (and girls) would jumped into these water ways to catch fighting fishes. The reason we ended up in this paddy field in Balik Pulau was because my husband wanted to show my sons how to catch fighting fishes! Hahaha, but who dares to do so in this dirty water, right? So, that’s why I enjoyed my camera a lot. It gives me a chance to kill boredom. But….my camera is broken, again. However, it will not be a problem because I do have a LOT of photos that have not been shown here. Those beautiful scenes will be a thing of the past in 3-4 years time as development makes its way there. I took some photos of paddy field in Balik Pulau when I went back for Raya. I was on my to Pantai Pasir Panjang near Pulau Betong and took some photos. Its like one huge green carpet. Some people don’t believe that we still have paddy field on Pg Island.